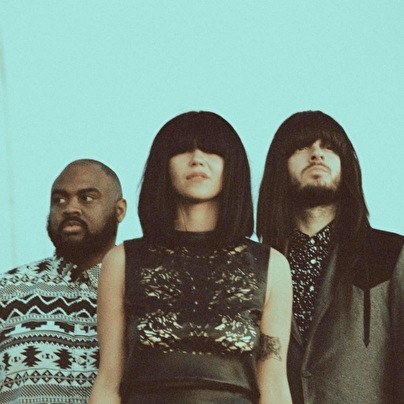 Texan trio Khruangbin is formed of Laura Lee on bass, Mark Speer on guitar, and Donald "DJ" Johnson on drums. Taking influence from 1960's Thai funk - their name literally translates to "Engine Fly" in Thai. The seeds of Khruangbin were sown when Mark and Laura were invited to tour with Ninja Tune's YPPAH supporting Bonobo across his 2010 American tour. The tour galvanised the two to start making music together more seriously, with DJ - he and Mark have played in the same gospel band for years - the natural choice for drums. Sharing their first recordings, Bonobo included Khruangbin's 'A Calf Born In Winter' on his 2013 Late Night Tales compilation. Subsequently signed to Late Night Tales offshoot Night Time Stories, 'A Calf Born In Winter' was released as a single in May 2014 and saw support from DJs Zane Lowe, Cerys Matthews, Tom Ravenscroft, Gideon Coe, Don Letts and magazines as musically diverse as i-D, The 405, Clash, Ransom Note, Test Pressing and For Folk's Sake. Four track EP 'The Infamous Bill' followed in October, with covers EP 'History Of Flight' on Record Store Day 2015. The band's debut album 'The Universe Smiles Upon You' was released in November 2015 to widespread acclaim. 'The Universe Smiles Upon You' steeped in the bass heavy, psychedelic sound of their inspiration, Tarantino soundtracks and surf-rock cool, was recorded at their spiritual home, a remote barn deep in the Texas countryside. The band listened to a lot of different types of music on the long drives out to the country but their favorites were 60s and 70s Thai cassettes gleaned from the cult Monrakplengthai blog and compilations of southeast Asian pop, rock and funk. This had a heavy impact on the direction of the band, the scales they used and the inflection of the melodies; which coupled with the spaciousness of the Texan countryside culminated in Khruangbin forming their exotic, individual sound. 2016 was a defining year for Khruangbin. After a chance meeting on BBC Radio, Father John Misty invited the band to support him on his UK & European tour. They hit the road for a month experiencing some of Europe's biggest stages – and they didn't falter once. A summer of live shows followed which saw them play the Park Stage at Glastonbury, a sunrise session at Love International Croatia, BST Hyde Park London and supporting Massive Attack in landmark event The Downs to name just a few. Come the Autumn the band took to the road again for their first US headline tour, this was followed by an appearance at Austin City Limits and a UK headline tour. They sold out shows including New York, London, San Francisco, Berlin and the list goes on. Where they find the time for further projects no one is quite sure but this is a band whose creative interests extend beyond the confines of traditional formats. In 2016 the band released a short film "Two Fish and an Elephant" directed by Scott Dungate. This beautifully crafted film, released to accompany the album track of the same name, was funded in part by an innovative Kickstarter campaign, so creative in its design it smashed its target and beyond. The resulting film had such impact it scored a premier on NPR. When you hear Khruangbins album it is likely you will fall in love with it, its fair to say there is nothing else out there that sounds quite like it. You see them play live and you fall in love all over again when you experience the music translated to stage in a way you won't have imagined. When Khruangbin play a show – they play a show!